Photo: Jeremiah Strawn House, ca. 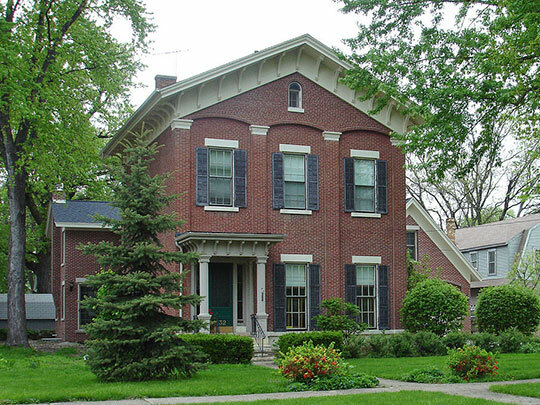 1855-1870, 532 Congress Street, Ottawa, IL. Listed on the National Register of Historic Places in 1994. Photographed by User:IvoShandor (own work), 2008, [cc-by-3.0 (creativecommons.org/licenses/by/3.0)], via Wikimedia Commons, accessed August, 2014. LaSalle County administrative offices are located at 707 East Etna Road, Ottawa, IL 61350; phone: 815-434-8202. LaSalle County has a long history that dates back to the several Native American tribes that inhabited the area. Records indicate that a number of Native American tribes lived in the region at different times, including the Iroquois, Potawatomi, Sauk, Fox, Ottawa, and Illinois. There is still a great deal of evidence today along the Illinois and Fox Rivers of the activities of these tribes. The first Europeans to enter the area were the French explorers Louis Joliet and Father Jacques Marquette. These men explored most of the Illinois River on their way to Lake Michigan in 1673. In December of 1679, the French explorer Rene Robert Cavalier received permission from the Governor of Canada to make a trip down the Mississippi River to locate the mouth of the river and passed through the area. Many French and Native American relics have been uncovered in LaSalle County. The area shows a wide diversification of Native American cultures indicating its use by tribes whose activity centers were hundreds of miles away. The remains on Plum Island, located just below the Starved Rock Dam, are thought to be the oldest in Illinois and are estimated to have been part of a culture from several thousand years ago. France controlled the Illinois River valley until 1763 when Great Britain took possession under the terms of the Treaty of Paris. Britain ceded control of the area after the American Revolutionary War in 1783 and in 1787 Congress passed an ordinance that created the Northwest Territories, which provided that no more than five states could be formed from the territory. In 1800, on an act of Congress, the territory was divided into two parts, the eastern part becoming the State of Ohio and the western part becoming the Indiana Territory. Illinois became a separate territory in 1809 and successfully petitioned to enter the Union and become the 21st State of the Union in 1818. During the 1820s, the first white settlers arrived in LaSalle County, establishing the cities of LaSalle, Peru, Ottawa, and Utica along the Illinois River. These settlers were attracted to the area from the Chicago/Lake Michigan area by the availability of easy water transportation along the Illinois and the Des Plaines Rivers and the fertile black soil. LaSalle County was formed in 1831, named for the early French explorer, Robert de LaSalle. LaSalle County Illinois, LaSalle County Comprehensive Plan, 2008, updated 2014, www.lasallecounty.org, accessed August, 2014.